It has often been said that where French pharmacies lead, the beauty world follows, and if you check in here regularly you’ll know I’m a big fan of a good pharmacy find. More and more of them are available in New Zealand of late, and a big part of that is thanks to the presence of Inesstore.com. Sarah Jackson is one of the co-founders of the website, which offers some of French pharmacy’s greatest hits that were previously unavailable here without a return ticket to Paris. Their edit is made up of products that have been widely used in Europe for years – with good reason. Their best sellers include the incredible Bioderma Sensibio H20 micellar water (often awarded the title of world’s best in its category), Embryolisse Lait-Crème Concentraté, NUXE Huile Prodigieuse and Leonor Greyl Huile De Leonor Greyl. When I ask her why people love them so much, she says: “French pharmacy hair and skin products have achieved their worldwide cult status due to their highly effective formulas that are dermatologically led and developed with specific concerns in mind. They also have fewer fragrances and colourants, allowing them to effectively treat the most sensitive skin types.” She adds that quite simply, “our hero products are functional and utilitarian. They create the foundation of a good skincare and haircare routine”. NUXE Huile Prodigieuse in particular is one of my absolute favourites, a marvellous multitasker that can be used as everything from a post-bath moisturiser to enhance and add sheen to a nourishing hair oil. It’s a multi-award winner, and is formulated with nourishing Vitamin E to rehabilitate stressed skin and maintain its optimal hydration levels. 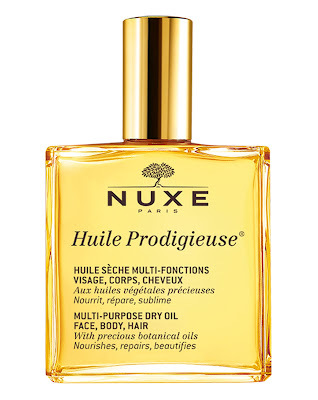 I love that over 98 per cent of the ingredients are nature-derived and Nuxe’s founder – Aliza Jabès – is firm in her belief that plants hold the key to great skin and hair. Suitable for nourishing face, body and hair, the lightweight, heavenly scented blend is made up of six skin-restorative plant oils – Borage, St. John’s Wort, Sweet Almond, Camellia, Hazelnut and Macadamia. It transforms skin, seals split ends, highlights pins and collarbones and can even be mixed with your usual moisturiser or foundation to deliver an extra shot of moisture when needed. Hair-wise, it can be sprayed on a natural bristle hairbrush for radiantly shiny hair or used directly on the hair (from a distance of around 20 cm) as a pre-shampoo mask. Massage it well into your hair and scalp, then wrap your head in a warm towel and leave for 15 to 20 minutes to allow Huile Prodigieuse to penetrate before shampooing. Just magic. It’s also non-greasy, preservative-free, silicone-free and mineral oil-free, which gets a major thumbs up in my books. Get some of your own by visiting Ines, today.